Lough Arrow's what I'm thinking of. it's worse than I've been dreaming of. is all the world enough for life to rise and fall. Lough Arrow with the moon above. a woman's bound to be there somewhere. the curse that comes on reaching love. Lough Arrow in a mist of love. the earth below and stars above. This song by Thom Moore was originally written about Drumshanbo and Lough Allen, and titled Drumshanbo On Its Own. Thom later re-wrote the song to feature Lough Arrow instead, and called it South Sligo Nocturne. I found the (very similar) new words somewhere and started singing them to the tune of Drumshanbo On Its Own, having heard Thom sing one of the versions (I can't remember which) at a live event where he was playing with Rick Epping. Thom eventually recorded the Lough Arrow version of the song under another title, The Mayfly and the Stone. This recording is on his long-awaited and warmly-welcomed album Seven Things Aloom (2013). The lyrics opposite are the version I sang on my CD, Hollow Lands and Hilly Lands (2012). I met her with good will. and cheered me all the day. that ever yet was born. is all I crave or care. This is a version of Child Ballad 217, The Broom of Cowdenknows. Francis James Child's collection, titled The English and Scottish Popular Ballads, gives several variants of The Broom of Cowdenknows, some of which contain lines which clearly relate to parts of the song which I call The Bonny Broom. The version given here is as I sing it. This is track 6 on my CD, Hollow Lands and Hilly Lands (2012). In the song, 'ewes' is pronounced 'yows' as is common in Scotland, and rhymes with Cowdenknowes (pronounced Cow-den-nows). 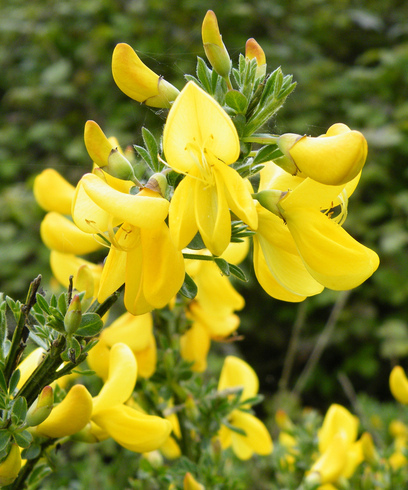 Broom is a shrubby plant with yellow flowers which is native to the Scottish Highlands. with no money in my pocket or gold for the counting? and I would marry no-one but my bonny blue-eyed Nancy. her walk like swans on water and her waist so small and slender. and I’d ask her for to marry me and there’s no man could be bolder. but let them all say what they will, to her I will prove constant still. Till the day that I die she’ll be my own lovely lady. but deeper by far is my love for my young lady. I first heard this extraordinary love song being sung by John Lyons in a session in Lena's (now Shortt's) bar in Feakle, Co. Clare. Many fans of traditional singing will no doubt be familiar with John and his brother Tim Lyons, both fine singers and musicians, and both gentlemen as well. The song is also known occasionally as Top of the Mountain or My Bonny Blue-eyed Nancy. It is track 9 on my CD, Hollow Lands and Hilly Lands (2012). Like they never will leave there again. To catch tiny fish for Japan. No white fish or trout here, we leave them alone. The inspectors raise hell if we take any home. Or call what he's taken his own? But the plant works three shifts now, there's plenty of pay. We ship seventeen tons of this garbage each day. And catch tiny fish for Japan. The old guys remember when the water ran clear. And no tiny fish for Japan. Now the days run together, each one is the same. The days run together, each one is the same. A song by Stan Rogers. 'All the old turtlebacks rust in the rain'. A turtleback was an unusual type of boat used for fishing on the Great Lakes which was enclosed from the hull upward (with no outer deck). Interestingly, there was also a type of cargo vessel called a 'whaleback', also peculiar to the Great Lakes, which similarly had a hull which curved up and around, resulting in a curved top with no outer exposed deck, the whole thing looking a bit like a submarine. till he slips beside me, sedate and bland. seven months without a shirt I am going, my money gone. of all my fortune, sheep and kine. until on the morrow I would find him there. a hundred topers, to make him glad. a soak so mellow, until the end. This is a poetic version of a song originally written in Irish a few hundred years ago. It seems clear that An Buachaill Caol Dubh (the dark slender boy) is a metaphor for drink/alcoholism, which haunts, follows and tempts the author, leaving him bereft of money, belongings, and contentment. It is an especially beautiful and poignant song, seeming to inhabit a world of its own, describing aspects of the Irish landscape within the story it tells and incorporating the legendary fairy queen of Thomond, who tries in vain to bargain with 'an buachaill caol dubh'. Thomond was one of the ancient kingdoms of Ireland, comprising Co. Clare and some of the surrounding counties of Limerick, Tipperary and Kerry. Cuan Binn Eadair is the Irish term for Howth Harbour, Co. Dublin. Inis Mor is one of the Aran Islands, off the Clare/Galway west coast. The 'grey rock', near which the author meets the fairy queen of Thomond, may possibly refer to the Burren in north Clare, which contains extensive and striking areas of grey limestone. This song is the final track on my Hollow Lands and Hilly Lands album.